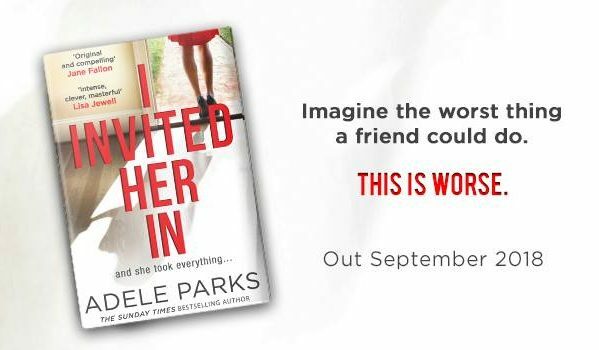 Review – I Invited Her In by Adele Parks – 3.5 Dark, Intriguing, Soul Destroying Stars!!! 3.5 Dark, Intriguing, Soul Destroying Stars!!! When Mel invited Abi to come stay with her family, she couldn’t possibly comprehend the dark, twisted, heart-breaking months that lay ahead. I Invited Her In was one of those books that I loved and loathed in equal measure. Adele Parks is an excellent writer and her story telling is fantastic. She captivates from the very start, and even when you feel yourself getting infuriated with a character, you still feel that urge to keep reading, Adele Parks certainly knows how to keep readers hooked into her stories. The storyline for me was interesting, at first, I wasn’t sure where it was going to go. I had worked out one or two secrets quite quickly, however, I wasn’t always sure on what Abi’s intentions were. It was clear the woman couldn’t be trusted and from the start I never took to her at all. I did find myself get frustrated and annoyed with some of the characters, I wanted to scream at them for not seeing what was staring them in the face. Some of their reactions made no sense to me at all, I couldn’t understand why they were allowing Abi to control their lives. Around the half way mark this story made a great turn, and it was then that I began to feel heartache for the hell that Mel was going through. She had been naive and for that I wanted to mentally slap her, however, she had reached a point of realisation and her life was literally falling apart around her. Adele Parks brought me round to her story at this point, and the frustration I had felt melted away. I could see the clever way in which Adele Parks had written this story and I applaud her for the way she keeps her readers hooked. I Invited Her In is a dark, heart-breaking story about secrets and deceit. It’s a story about realisation, that some people’s lives aren’t always as they seem; that the mundane life isn’t always as dull as you think.